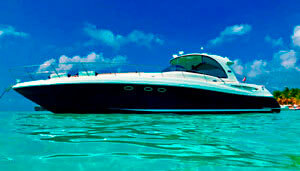 Luxury yacht rentals cancun, Mexico! 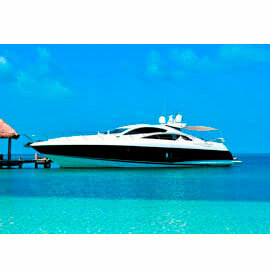 Enjoy the amazing world of the Mexican Caribbean Islands on board one of our Luxury yacht rentals in cancun. We have selected the most luxury yachts for your private day cruise. Enjoying the most unforgettable moments with your loved ones! 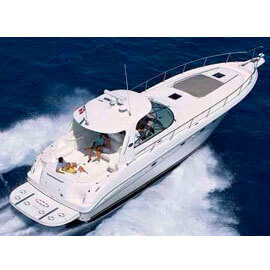 Boat rental cancun to isla mujeres, Luxury boat 440 Sport Yacht. 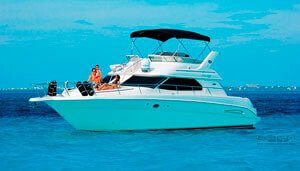 Private boat rentals cancun, luxury boat cruise cancun isla mujeres! 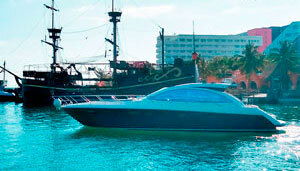 Join a day cruise to isla mujeres on this sophisticated luxury yacht. 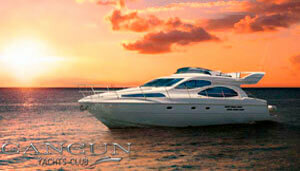 Exclusive sunset dinner cruise in a private luxury yacht in Cancun. 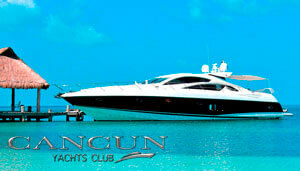 Cancun Yachts Club - Luxury yacht rentals in Cancun, Mexico. 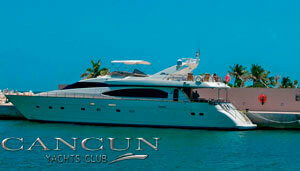 Welcome to Cancun Yachts Club! Cancun Yachts Club, has the best luxury yachts for rent in Cancun and the Mexican Caribbean, our mission is to ensure the service and luxury in each of our yachts available with the best prices in Cancun. 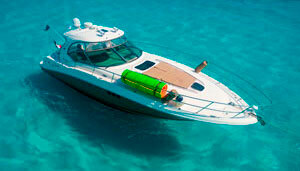 Plan a Vacation, Business center, Parties and more water activities in the turquoise waters of the peninsula. Do not let go, book and Live your Dream in the Mexican Caribbean. Our luxurious yachts are innovate in performance and design, Cancun Yachts Club crew is pleased to provide the best cruising, since our boats are fully suited for fishing, snorkeling or just relaxing. depending on your need for entertaiment, our fleet provides besides luxury yachts, express cruiser, fishing boats and mega yachts. do not wait any longer. 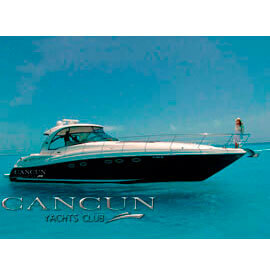 Yachts in Cancun - Boat rentals in cancun. From the top to the bottom of the Caribbean, Discover a small piece of paradise with turquoise seas and white sands from Cancun, We offer yacht rentals in cancun with the most complete service aboard. A yacht charter also affords a unique opportunity to experience a wide diversity of cultures through the spectacular scenery, ancient history and amazing food. Yachting is a passion. It is a pleasure to share that passion with the discerning clients and the capable crew who take pride in being part of our team. Our Yacht Club Cancun Mexico, aims to provide a comprehensive range of services in-house to maximise the client's enjoyment with the yacht. Wedding planner by yacht, Wedding proposal, bachelor party, Private boat rentals, Boat charters, Shared Yacht, Yacht Rentals, Yacht Dinner Cruise, Luxury Yacht Vacations, Snorkeling Adventure Tours, Yacht Charters, Boat Hire, fishing Tours, boat tours, Private Events, Fun Party boats, Groups and more activities on yachts, only here in: Cancun Yachts Club, Enjoy it !! * Prices are per hour. * Our packages are subject to availability. Do not let go, book and Live your Dream!! 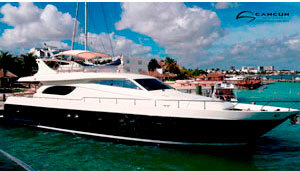 I contacted Nestor and he did a fantastic job planning our yacht he worked everything out to fit our needs. The crew was unbelievable and the chef made amazing food! My family had a amazing time and we made memories we’ll keep forever! I highly recommend! Thank you to everyone who made this day unforgettable. We rented a 460 Sea Ray Sundancer for 8 hours on our anniversary Jan 6, 2019. I was leery of booking something online in Mexico but the communication, rates and deposit due prior to arrival made me feel at ease. I had multiple questions about weather and other misc things leading up to the day and all emails were replied to in a timely manner. Transportation picked us up from our resort in Playa Mujeres on time. They upgraded us to a larger boat upon arrival. The boat was clean and the crew was very attentive to our needs. They provided guacamole and ceviche for our on board snack - I would recommend asking to upgrade the food to an actual meal if you’re planning on doing the 8 hour day. The weather held up to be a perfect day and they chartered us around to various places per our specifications of what we were looking for. They had food for the fish when snorkeling and quickly stopped by the Isla Mujeres Dock to get more mixers for us so we didn’t have to pay the $30 docking fee to tie up there. It was the most memorable anniversary yet and the crew, yacht, and communication leading up to the day was five stars all around. They even took pictures of us through the trip. I price searched all over the area and their pricing was hands down the best in town! We will be booking through them again our next visit the Cancun without a doubt. My girls and I rented through this company for my bachelorette party. It was the best decision ever!!! Thank you so much!!! Highly recommend this company!!! What a great experience!! Nestor was great to work with for the booking and the boat was everything we wanted. Our crew was amazing and the food on board was so amazing! Our captain was Joel and our first mate Miguel and they made us feel at home. They even arranged for our transport, everything was perfect. We cruised around, anchored, swam and saw the sights, an amazingly relaxing day! I will use you guys again!! Was the high lite of our vacation, yacht we chartered was exactly as described on website. The crew was very good, and attended to all our needs. We booked yacht for 8 hours, did some snorkeling, swimming, dined at a cafe in Isla Mujeres on shore and cruised the island. 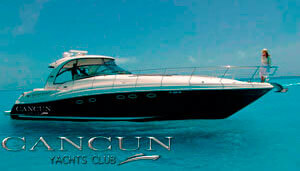 Very well priced too, would highly recommend Cancun yachts club for your next yacht charter. We will definitely re book next time we're in Cancun. 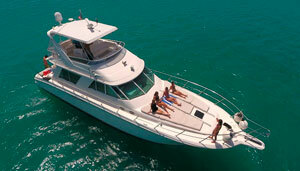 We rented the Searay 46 for a Hen party and we surely had such an amazing time and experience. Nestor was quick and efficient and special thanks goes out to the crew (Lupe, Lucas and Leo) for being so helpful and attentive. Our boat exceeded our expectations!! Thank you for such an unforgettable day! The food was amazing especially the guacamole! We will definitely contact you again next time we come back!! Thank you for making it a great day with a wonderful boat!!!!!!! I just wanted to thank you and your crew for the day on the water. We all had the best day our entire holiday the day we went out with your crew. 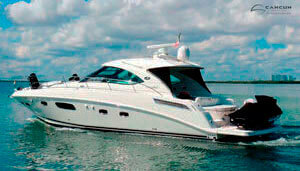 My wife and rented the Sea Ray 44 for a full day on the water. Captain Tito and Angel were our crew and they were absolutely amazing. They made our experience top notch from start to finish! They were very accommodating to all our requests and would 100% recommend them to friends or family. I would like to thank you for the fantastic service we received. The boat and crew were more than we expected. The crew worked hard and no one aboard wanted for anything they provided a high quality of service. Thank you so much. My Husband & I Had Such A Memorable, Romantic Evening/Night...Everything Was Perfect Atmosphere, Food & Staff Were Amazing. My Husband Enjoyed His Surprise He was All Smiles... Beautiful Yacht... Thanks For Helping Me Make My Husband's Birthday Even More Special.. The Dinner SunSet Cruise Was Worth Every Dollar!! Just Beautiful!!! We booked a Sunseeker 56 yacht through cancun yachts club for my wife's 30th Birthday and we were blown away with how good the yacht was and the quality of service from Miguel and Alain on board. Customer Service does not come much better than what we experienced on the yacht that day. The whole experience, from booking with Nestor through to the transport back to the hotel was hassle free and done with a smile. I would highly recommend using cancun yachts club to anyone who is planning a private yacht excursion with friends or family. A day and birthday that my wife and family will never forget. Thank you Nestor, Miguel and Alain. Had the best day ever on our yacht with 12 girls for my bachelorette .. The crew were amazing and your company are so fantastic . Picked us up from our hotel and dropped back again. Loved our day on the boat and the crew was amazing! We had a great day snorkeling and riding around Isla Mujeres. Thanks for everything! We had an amazing time! The guys on the yacht were amazing and the whole time was one I will never forget. I would recommend to anyone and hopefully do it again myself when I return. Nestor was a great too and was all on hand to help with any enquirers. This was my 3rd time using Cancun Yachts Club. Was up graded to a bigger boat because issues with mechanics on the one I had originally chartered. Great prices and accommodating to all our needs. The Captain Johnathan and Mate Dave were Fantastic. From serving food - Drinks to helping us with the snorkeling and places to go. We all had a Fantastic Time. Will definitely use you again. Thanks for the Great Memories!! We had so much fun. The crew was excellent and we can't wait to go out again with y'alls group. Everything from start to finish was superb. Thanks again for such a wonderful day! Boat was very nice crew was AMAZING. timing and cruise experience was perfect. Customer service was on point and helpful. Good job! I booked the 55ft Atlantis for a bachelor party. The yacht was great, everything we hoped for and more. The crew was very friendly and accommodating, making sure all our need were fulfilled and everyone was happy. I dealt with Nestor through email booking this trip. Nestor did an amazing job of lining everything up for us. No detail was missed. Nestor fulfilled every request we had. I can't thank everyone involved enough. This bachelor party was everything we expected and more. Thanks to everyone involved! 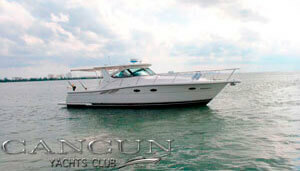 I would highly recommend booking with Cancun Yachts Club. This is the second year we enjoyed a cruise with Cancun Yachts Club. The service from the captain and his staff was excellent and we had a great day of cruising, swimming and relaxing. We'll definitely be doing this again next year! I booked the sunset dinner cruise to do a proposal to my now fiancé. The crew was awesome photographer was great even captured a video the views were incredible best money spent and the meal was amazing I inform anyone that wants to do something like this to rent through these guys it was a surreal experience. Thank you for making this happen,we had an amazing time! The Captain and crew were nothing short of perfection. Please send my gratitude to the photographer her picture were absolutely beautiful. Had an amazing time on our day trip! The yacht, crew, captain and Nestor handled all our needs! Can't wait to back! Just wanted to say thank you, once again for the hospitality and superb service of your yacht charter service. 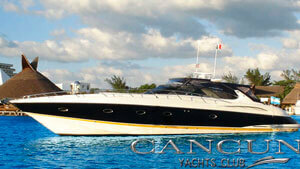 After reviewing and screening other private yacht charters, I had a gut feeling to go with Nestor of cancunyachtsclub. Not only, are this guys, professional and so sweet but the best prices in town. Ask for sweet Cesar and the very nice Captain Ray! I love you guys and I will be back soon!!!! I would like to thank Nestor and the rest of the staff on providing an amazing experience. Our group of 12 came down to Cancun for a bachelor party and our highlight was definitely the day we spent on the yacht. The crew was friendly and the utmost accommodating. No details were missed on our requests. Highly recommend and will be back again! Thank you! I had been working with Nestor for over 7 months to plan my proposal on one of there amazing Yachts. I am sure I asked over 100 questions and with every email Nestor sent back not only was it sent in a timely manor but he answered every question and made me feel everything would run perfectly. The day of my proposal the yacht looked fantastic, the crew was AMAZING, ACCOMIDATING, and all around FLAWLESS! The food that the Capitan and crew handmade was the best meal I had in Cancun! My now fiancé and all my friends and family LOVED this experience. Without Nestor I don't know what I would of done. 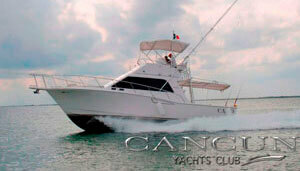 Please do not hesitate or think twice Cancun Yachts Club is the best! Nestor is FANTASTIC and will not leave you disappointed. I cannot express in text how much I loved this experience! So check out our video I made of the day on the yacht! The boat and crew were excellent. Our party had a great time. Everything Nestor told us was true. 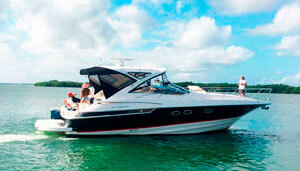 We recommend this company to charter a boat while visiting Cancun. Thank you Nestor, we look forward booking another yacht from you again when we return. You guys made this the perfect experience! Thank you so much! The Boat was amazing and the crew was awesome. They took care of everything. We had a beautiful sunset and it all made a perfect setting to propose to my fiancé! Thanks again for one of the most memorable moments of our lives! Had a fantastic time on the sea ray 47. The food was lovely and the service was excellent. Didn't let you do anything for yourself. Had a very fun and romantic time - thank you! Highly recommended! We really enjoyed our day on the water! 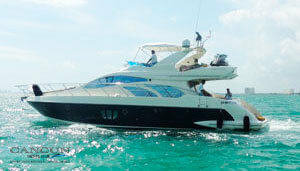 The boat was pefect for our group and the crew were excellent and provided great service. Nestor was especially helpful in seeting up the day for us and meeting or specail requests. We will definitely be back! We had a wonderful time yesterday on the yacht. Captain Paco was very nice and accommodating and his crew were very friendly. Food was very good. 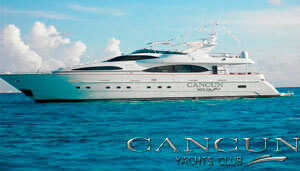 We had a great experience and will be sure to book another yacht with your company on our future trips to cancun. Thank you for all your help! 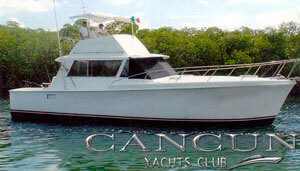 Thanks for the help with the boat we will definitely use Cancun yachts club again, I am here every other month. Thank you again for your assistance with coordinating the cocktail cruise for my friends. We had an incredible time! The crew was great and kept us entertained. My next trip to Cancun and Riviera Maya I will use your company again. Nestor was awesome and very accommodating. The boat was exactly as pictured and described. The girls and I had a great time: 4 hours was not enough!Hotel pickup and drop off was arranged. Staff was very nice and friendly. Highly recommend. After contacting the yacht club a few years ago, Nestor arranged our first trip. My family and I were very pleased. I then contacted Nestor again recently to arrange this trip. I asked him for some ideas for an itinerary. He presented me with an outstanding itinerary and took care of ALL the arrangements for me. My family and I had the perfect day swimming with the dolphins, snorkeling, etc. The captain and mate were just as outstanding as well. We have already discussed with Nestor and the captain a possible itinerary for our next visit to Cancun. We wouldn't think of using any other company for our excursion. Nestor does an amazing job for me! We look forward to continuing to work with Nestor!Sincerely,Steve Dekelbaum. Booked the Atlantis as a surprise for my Fathers 50th birthday and couldn't have asked for a better day! Crew were fantastic and the yacht was beautiful. Will definitely book again.! Thanks Nestor, my Father had an unforgettable Birthday. Will recommend to anyone I know going to Cancun. Just want to say thank you so much! Everything was perfect and the crew was amazing!!! The food was amazing and the yacht was fantastic!We will definitely do it again next time we come to cancun.Thanks again!. We had a great time. We will definitely return and next time! !We love the place, extraordinary.Special thanks to the extremely polite crew you have (Alfredo and Hebert)..
We rented the Atlantis 55 and it was above our expectations! There was 13 of us and it accommodated everyone. Plenty of room, the food they had on the boat was great as well! The 8 hour trip was perfect! 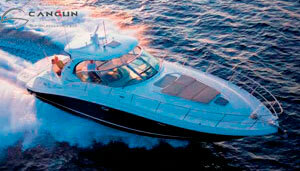 If you're looking for a luxury yacht for your trip to Mexico I highly recommend them! First of all i want to say thank you to Nestor who help me with everything i needed.The boat was amazing , the service , the food , everything was just perfect.Thank you Cancun yachts club for helping me propose in the most amazing way. We had a great time! We were taken to an island where we did get screwed over on the conversion a little bit when they gave us the total and then ran it in Pesos only giving us about a 9.5 conversion rate when it was supposed to be closer to 13. Also the deck crew took it upon themselves to order food on our tab without asking which I guess was fine since we just used it as there tip. Other than that the boat was great and Nester was great to work with! Wow fantastic !!! thanks for your help… We had a great time! Hopefully we’ll see you again next year !! Had an amazing time on the boat. Wonderful service the crew was great. Deffinetly one of the best days in Cancun my friends and I really enjoyed the whole day. Una experiencia espectacular un bote muy agradable y un servicio por arriba de lo esperado, tuvimos un dia de familia espectacular que nos llevo a tomar dos horas adicionales ya que nadie queria bajarse. Muy recomendado. We had a great time with Capt Chaloupa...... Thanks for helping set this up. We will be back again next year. My family all agreed it was the highlight of our trip to Cancun. It also gave us some insight on Isla Mujeres. We ended up going there a couple of days later and had dinner at Casa Rolandi. Excellent food and setting. Take care and our best wishes. 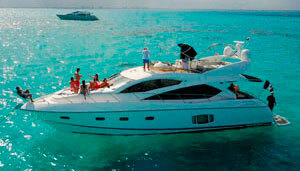 Activities to do in a Luxury Yacht. 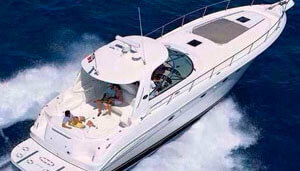 Renting a boat in cancun, you can enjoy the comforts of a luxury which can include waverunners, Jacuzzi, dingy, kitchen, living area of sun, with a certificate crew to help him have a inolvidables vacation. You can also the best snorkel in the most popular reefs of isla mujeres with the help of a tour guide, swim in the crystal and passive water of the caribbean, relaxing on the bahia enjoying a glorious sunset. We also have cruise in the evenings with a romantic and private dinner, special events weddings, birthday parties, with the best onboard sound and exclusive privacy on the best places in the Mexican Caribbean. 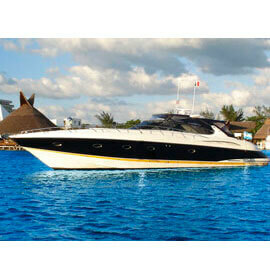 Luxury yacht rentals in Cancun to Isla Mujeres. 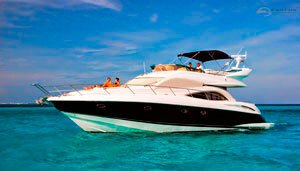 One of the most enjoyable, luxurious and relaxing activities in a private boat tour. 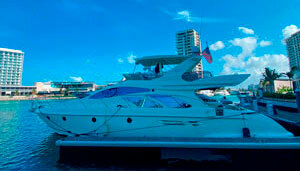 boats have a great demand in the market cancun. Cancun has the most beautiful beaches of the Mexican Caribbean and be able to enjoy aboard a super luxury yacht with a professional crew, we usually do a yacht tour to isla mujeres with a nice snorkeling in a different point of isla mujeres and them going to the most quiet beach called punta norte, on this area you can have a relaxing time and swimming in a safe place. Day cruise to the Caribbean and activities to do. Enjoy a Spectacular Day on a boat, navigate away from Cancun aboard on a Luxury yacht and Join ours yachts with the most luxury service, design and performance. Be our admiral to Explore and Discover the most important areas for Swimming, Snorkeling, Diving, Fishing or just cruising to Cozumel, Holbox, Puerto Morelos, Paya del Carmen and more peaceful and pristine waters of the Mexican Caribbean. Boulevardo kukulcan, km. 8.5 Zona hotelera.